"Will youth take up the challenge — “grasp the nettle” as it were — or will they follow the example of their parents and grandparents?" Last week we parsed some excerpts from Autobiography of Ma-Ka-Tai-Me-She-Kia-Kiak, or Black Hawk, Embracing the Traditions of his Nation, published in 1833. The author described the seasonal cycles of his Mississippi Valley village in the 18th and 19th centuries, before the Lewis and Clark expedition. By many measures, the benefits of global industrial civilization peaked in our youth, but for most middle-class baby boomers of the affluent countries, the continuing experience of those benefits has tended to blind us to the constriction of opportunities faced by the next generations: unaffordable housing and land access, ecological overshoot and climate chaos amongst a host of other challenges. These are all things that previous generations were warned of by Massasoit Ousamequin, Tecumseh, Sitting Bull (Húŋkešni), Wovoca, Geronimo (Goyaałé), Cochise, Crazy Horse (Čháŋ Óhaŋ), Black Elk (Heȟáka Sápa), Chief Joseph (Hinmatóowyalahtq̓it), and many others, so one need not place too much blame on the boomers. Still, the postwar period was an inflection point. I am a white middle-class man born in 1955 in Australia, one of the richest nations of the ‘western world’ in the middle of the baby boom, so I consider myself well placed to articulate an apology on behalf of my generation. We were the first generation to have clear scientific evidence that emergent global civilization was on an unsustainable path that would precipitate an unraveling of both nature and society through the 21st century. 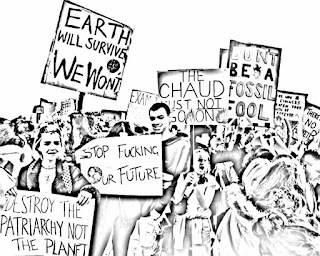 Although climate chaos was a less obvious outcome than the no-brainer of resource depletion, international recognition of the reality of climate change came way back in 1988, just as we were beginning to get our hands on the levers of power, and we have presided over decades of policies that have accelerated the problem. One could also say adequate scientific proofs had been adduced much earlier by Fourier, Tyndall, Arrhenius, Keeling, Broecker, Calendar, Malthus, and many others. I was litigating climate change over water protection issues in the early 1980s, using these types of proofs, and I was not the only one. To claim we did not know before 1988 is a bit disingenuous. Wim Sombroek’s published research on Amazonian dark earths (terra preta) as a means to reverse climate change came in the 1960s. Over the years since, the adverse outcomes have shifted from distant risks to lived realities. These impact hardest on the most vulnerable peoples of the world who have yet to taste the benefits of the carbon bonanza that has driven the accelerating climate catastrophe. For the failure to share those benefits globally and curb our own consumption we must be truly sorry. We might hope this apology is itself a wake-up call to the younger generations that are still mostly sleepwalking into the oncoming maelstroms. In raising the alarm we might hope our humble apology will galvanize the potential in young people who are grasping the nettle of opportunities to turn problems into solutions. We hope that this apology might lead to understanding rather than resentment of our frailty in the face of the self-organizing forces of powerful change that have driven the climaxing of global industrial civilization. Finally, the task ahead for our generation is to learn how to downsize and disown before we prepare to die, with grace, at a time of our choosing, and in a way that inspires and frees the next generations to chart a prosperous way down. This perspective pinpoints the source of hope, the direction that could and should be taken, led by youth. But will youth take up the challenge — “grasp the nettle” as it were — or will they follow the example of their parents and grandparents and wind up like the tele-tubbies in Wall-E, slurping Biggies while cruising the galaxy in a Tesla Skyliner searching for another habitable planet? Personally, I think we need to step back and stop wringing hands. We are going to be pursuing all three of those strategies. To ignore the latter two would increase our suffering and loss, but to ignore the first would doom us for certain. What that step back should bring into view is the liminal era we are in, and the greater context surrounding all our problems and dislocations. In the 1970s, anthropologist Victor Turner advanced the notions of “limen” or threshold, and “liminality,” the individually dangerous but culturally fertile border zone where the candidate in a rite of passage straddles “betwixt and between” (in Turner’s phrase) extraterritorial structural conditions, passing between identities and cultures while not adhering firmly to any. The liminal zone is dangerous in the sense that it is easy to lose your way and waste an otherwise happy and productive life, but fertile in that it invites imagination and fantasy; symbols and magic; creative expression and deep transformation. It is a region of vague possibilities for profound change. Precisely when we entered the liminal phase of our civilization is difficult to say, because global consumer culture is a relatively recent phenomenon made possible by the caloric density and abundance of fossil energy. While coke-forged Toledo steel and Chinese gunpowder allowed Europeans to evict the Moors and then turn to enslaving and ethnically cleansing the Americas, coal and fireworks had been around a long time before then. I would hazard to say the fossil era only really got going about the mid-nineteenth century, but was in the long stem of the J-curve until mid-20th, approximately until the Second World War, when it entered the gradual upward arc of the J — the “hockey stick.” In this, Holmgren has his dates right. Since the start of the 21st Century, a juggernaut machine culture, propelled by inventions of the boomers, has been in something approaching a singularity of planetary devastation, accelerating infinityward, as if the hockey stick were flipped to put the blade on the horizontal axis and the handle now running towards vertical, except that at this very pinnacle of seeming unending apogee it has struck a small snag. It is running out of fuel. After peaking its affordable (from an energy return on energy invested calculus) conventional fossil fuels, boomers dove headlong into unaffordable unconventional fossil fuels (fracked gas, oil shale, deep offshore, etc.) and are closing in on the inevitable financial and geophysical reckoning, including climate change, plastic pollution, cancer, etc. The global empire, mirroring the pattern of Maya, Romans, Greeks, Egyptians and others, has reached a new liminal, theater phase, or silly state, evidence of which is all around us. It is a region of vague possibilities for profound change. David Holmgren, Bernie Sanders, or Alejandra Ocasio-Cortez can wail about income disparity, student loans or unaffordable health insurance, but such minor inconveniences are inseparable from this stage of separation. Living in a liminal period is like simultaneously occupying parallel universes, where some people believe in Y2K, aliens, peak oil, climate change, Russiagate, or angels, while others, even friends and family, may adamantly believe the opposite. These universes never merge but instead rhythmically collide, inducing instability — economic, social and political. Science and logic are irrelevant. Adrift, people flail about for life rafts to grasp. If a charismatic right-or-left wing tyrant promises return to stability, he draws followers like moths to a flame. If a cult leader says he or she can offer mental tranquility amidst the chaos, you jump, no matter how ridiculous the specifics of that discipline would have seemed to you back when things appeared more normal. If an authority figure offers you a special diet pill, a revolutionary app, or some other fantastical cure for the ennui you are feeling, you buy. Don’t be ashamed. All normal. This is what liminality looks like. To get to the other side, however, requires a plan. Daniel Wahl has taken to calling those who are sensing this change the ReGeneration. It is a useful term. What needs to be regenerated is not a human society that was appropriate at the beginning of the industrial era, or for that matter, the desert religions developed to preside over apportionment of artificial scarcities after humans foolishly cut down forests and salted their soils 3000 years ago. What needs to be regenerated this time are those trees and those soils. Humans regenerate, nature deliminates. 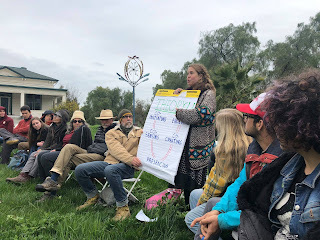 To guide these ReGENerates and to beckon legions of fresh converts to see what is right in front of them and join, we have Transition Towns, the Global Ecovillage Network (GEN) and Ecosystem Restoration Camps. These councils, each in their own way, have been exploring the other side of these rites of passage: post-liminal bioregional tribes; patterns of living that can be sustained into fragile, hazardous and uncertain futures; terraforming damaged landscapes to bring forth water from rock; permacultural, equitable, gift economies. What happens every year at Burning Man or Glastonbury, and perhaps this year at Woodstock 50, may not be perfect representations but they are open source laboratories where anything goes and no idea is spurned. To the degree that we are really seeking a compromise — some sort of denouement between collapse and the status quo ante — we are on shaky ground. We’d be better off studying Black Hawk or Black Elk. One such edgeman is John Dennis Liu, currently Ecosystems Ambassador for the Commonland Foundation and a Visiting Fellow at the Netherlands Institute of Ecology. Liu is progenitor of the Ecosystem Restoration Camps. We know enough to say that Biodiversity, Biomass and Accumulated Organic Matter are the evolutionary factors that have always regulated the Earth’s climate (as well as soil fertility, biodiversity and the fresh water system (hydrological cycle). Each of us affects this every day with all sorts of choices. When we are unconscious of the importance of the need for total vegetative cover, the role of the accumulating organic matter and the amazing diversity many of our choices are negative. Consider over-consumption, energy use, urban design, industrial agriculture, even just how we make grass lawns in all biomes. When we understand how natural ecological systems work to cool, to infiltrate water, to support the microbial and fungal communities that transformed the Earth making it possible for us to exist then we act differently. It really gets interesting when we realize that together we are powerful. We can join together in Ecosystem Restoration Camps and immediately and directly have a major impact on maintaining total vegetative cover, encouraging biodiversity, growing fertile soils, lowering temperatures, increasing moisture availability, and regulating the Earth’s climate. When we have this level of understanding we realize that it is not just our negative behavior that affects the Earth’s climate. We can learn and implement all the best practices to mitigate and adapt to climate change. Then we are the answer to climate change. Liu’s dream is to have camps all over the world and engage millions of candidates in this rite of passage, embodying the change they want to see. ERC created a non-profit foundation in the Netherlands and set up a prototype camp in Spain in 2017. A second camp began in Mexico at the Via Organica Ranch in San Miguel de Allende in 2018. Now in California the edgeman met with his neophytes to discuss making camp in Paradise. What may coalesce from these kinds of experiments could be something like Black Hawk’s village; it could be something like the “technicolor Amish” phase of The Farm; or it could be something entirely different and unpredictable. Holmgren is right about this: it will be the ReGeneration’s choices that matter, not the Baby Boom’s. I think that this blog today is hitting several nails on the head. We need to recognize that we have past a point in believing that the status quo has any meaningful answers. 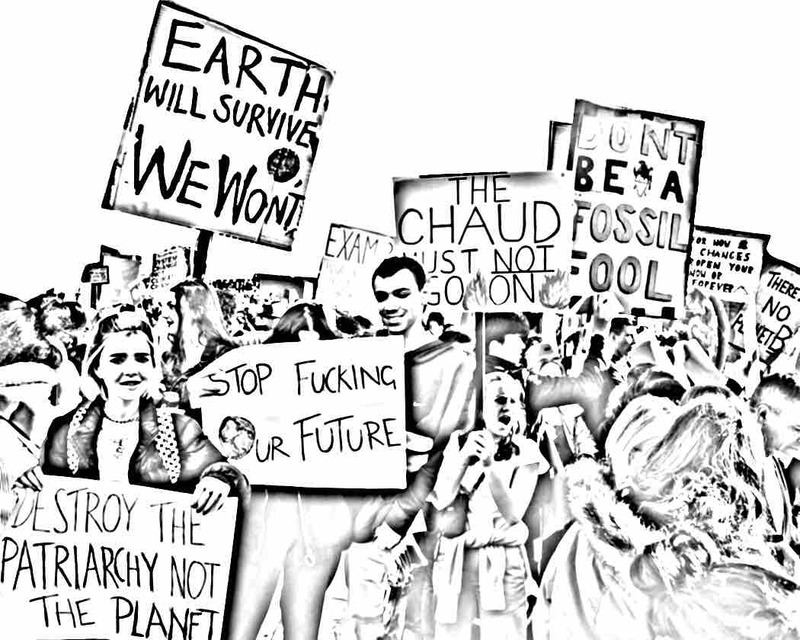 Politics, social movements, within the framework of the status quo, are irrelevant at this time. It is becoming slowly obvious to people that I know that there is no better "mousetrap" to fix things (keep things) the way they are. If there were it would be out there for public consumption....and it isn't. As you have alluded to in this excellent edition, it's time to get the "tribes" together and go about the business of regeneration since it's clear that we don't need (nor want) approval to do so. If I may add to my first comment. It's not just the young people who need to be involved......it's us the boomers who need to put down our remotes, our travel brochures, our reminisces about the past (or future) and join in. We, of all people need to admit that the promises as handed down to us is not the course to stay on but to leave it and look to a new beginning.